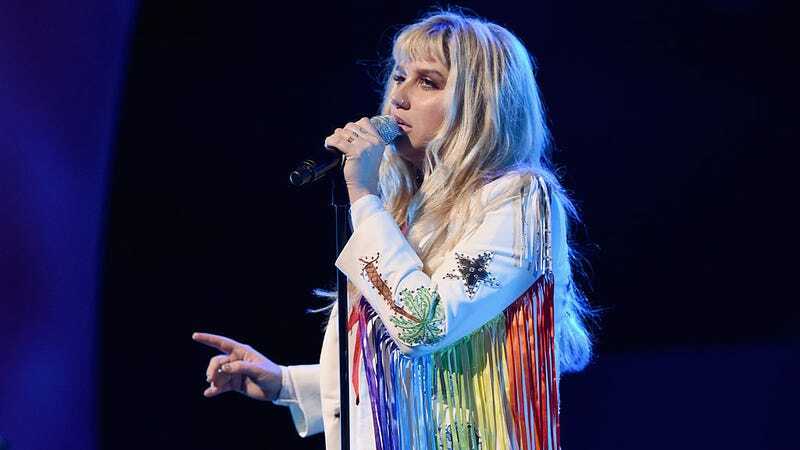 Kesha’s new album Rainbow comes out this Friday after a long battle to be released from her contract with her label, Kemosabe, and her former producer and alleged abuser Dr. Luke. But even though Dr. Luke is no longer the CEO of Kemosabe, it appears nobody can confirm for sure that he will not be profiting off of Rainbow. You might remember that in 2014, Kesha filed a lawsuit against Dr. Luke asking to be released from her contract with Kemosabe (and parent company Sony.) Kesha claimed that she was unable to record and release music without his involvement—troubling, considering she also alleged that Dr. Luke had physically and emotionally abused her. The problem is that according to Sony, Kesha is not technically their artist since she had an agreement with Luke through his publishing company Kasz Money. In 2016, a New York judge denied her injunction to be released from the contract, so now Rainbow is being released though Kemosabe. According to a New York Magazine report, representatives for Dr. Luke, Kesha, Sony, and RCA could not confirm that Dr. Luke was not going to make money off of Rainbow, considering he still has ties to Sony. They also could not confirm if Rainbow and accompanying music videos were funded by Kesha alone rather than the label. And it’s also unclear who owns the publishing rights to Kesha’s new music now, because in the past it’s been Dr. Luke. Earlier this year Dr. Luke said Kesha owes him $1.3 million in royalties and demands a cut of everything she makes from tours, merch, and anything that uses her likeness. All of this is especially enraging considering that Rainbow so far sounds like an album that directly addresses Kesha’s relationship with Dr. Luke. It may very well end up unintentionally supporting the person it intends to speak out against.